There are only four unique movements that reoccur throughout this composition. The number of chords may seem overwhelming, but each is a simplified version of chords you may already know. At no point will you need more than two fingers on the fretboard. Chords and tabs are available at Patreon.com/swiftlessons. Let’s get started! So it goes Intro, verse, turn around A, verse, chorus, verse, chorus, turn around B, intro? Can’t knock this, but, splitting hairs, doesn’t McCartney go to the D bass on the turnaround “moment to arise”? Nice, clear, lesson though. Thanks dude, your lessons are the easiest to pick up. I learned how play Black Bird when I was in the 9th grade. My favorite picking song. Hi Rob! amazing lessons mate! I have one request .. could you do “don’t let me down” from The Beatles (John Lennon) ? which he wrote for Joko. keep up the good work! Brilliant…..I have tried all the YouTube blackbird tuition videos and yours is the only that completes it properly. Thanks, Swift! Love your lessons man. 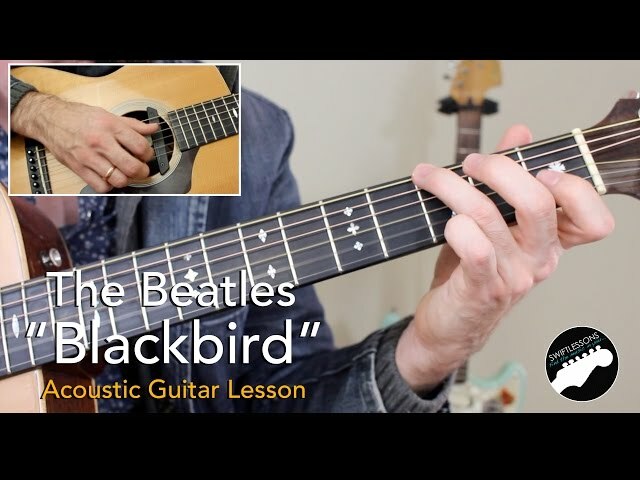 very clear instructions, best “Blackbird” lesson so far. looking forward to reward your free lesson with a vid from me playing it after your instructions. THANKS Rob! What a beautiful voice, I’d spend all day listening! Great lesson, thank you! This is a great step up for me after working through your Homeward Bound and The Boxer lessons. Thanks! I have good reason to pick you !